Here are tips from preschool staff at St. David’s Center near Minneapolis for taking early learners outdoors. Before going outside with your students, get to know your area’s outdoor spaces on your own. Ask someone who is familiar with nature in your area to identify the plants and animals. The only ones you have to worry about are the dangerous ones. I’ve never found a dangerous plant or animal on our school property. Maintain an extra clothing box to supplement kids’ clothing. I’ve added some adult-sized hats, mittens, and boots for parent volunteers who also forget. The first time out with children, do something simple. Let them learn their boundaries. Establish a consistent schedule for going outside. Teachers complain that there is not enough time. It takes a few weeks, but eventually I can get a room of 4-year-olds to be dressed to go outside in under 10 minutes. 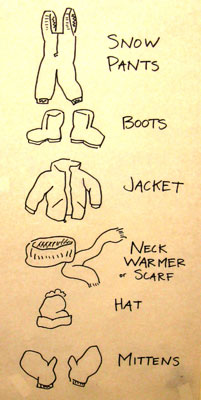 Poster to show young children how to dress for winter and snow. Make sure you inform parents that their children WILL get dirty, and that they must be dressed in play clothes. If parents want kids in fancy clothes, tell the parents to bring the fancy clothes when they pick up their child. Let the children play and explore. But also give the children something to do to stay focused on the lesson. We do storytime outdoors (they sit on carpet squares), or I give them sand pails to collect nature items to sort. I once taught in a school that had only mowed lawn and a tree. At first glance, outdoors looked pretty boring so we didn’t use it. I’m learning how other schoolyards and nature centers are spicing up these kind of surroundings, such as: leaving logs, stumps, and fallen trees around for climbing; “planting” surprises such as bones, cones, and stones; installing weatherproof trunks for outdoor supplies (child-sized rakes, snow shovels, sand pails, binoculars, carpet squares, rain boots, etc.). Check out the Appendices in PLT’s Environmental Experiences for Early Childhood guide, for example “Playing It Safe Outdoors”, “Taking Neighborhood Walks”, “Setting Up an Outdoor Classroom”, “Encouraging Unstructured Outdoor Play”, and more. Get more tips from Minnesota elementary and secondary teachers. I really appreciate your tip to make sure children are dressed in play clothes when they are in an early childhood education center. My wife is pregnant at the moment, and we do not know what we are doing since it is our first child. I like that you mentioned how you need to help your kids understand the benefits of learning, connecting with nature, and playing outside. I want my kids to explore, and I want to teach them about the trees and animals. Thanks again! I like how you said to do something simple for the first time going out with your students. My son goes to an early learning center and they are going on a field trip. Thanks for the tips for teaching outside. Exploring can yield so much for a child. They can learn about their world and their place in it. And, as you said, giving them something to collect their experiences in could also help out their learning as a whole. Amazing ideas! outdoor learning really beneficial for kids. Kids enjoy to learn in nature, which really helped kids growth in physically and mentally. It’s help to build creativity. Thanks for such a wonderful blog.